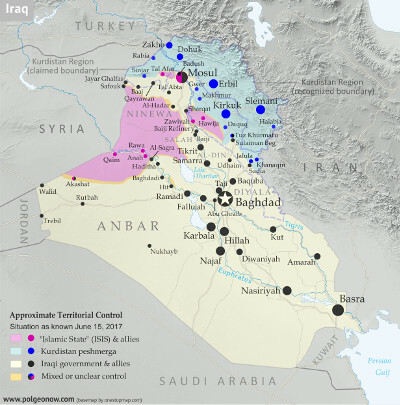 Political geography milestones in the last month include the Syrian government's reestablishment of a border with Iraq (entirely controled IS, Kurdish forces, and rebels since 2015); Syrian rebels' loss of their last border with IS, near Tanf; and the first time in a year that the government has controlled any of Raqqah province. 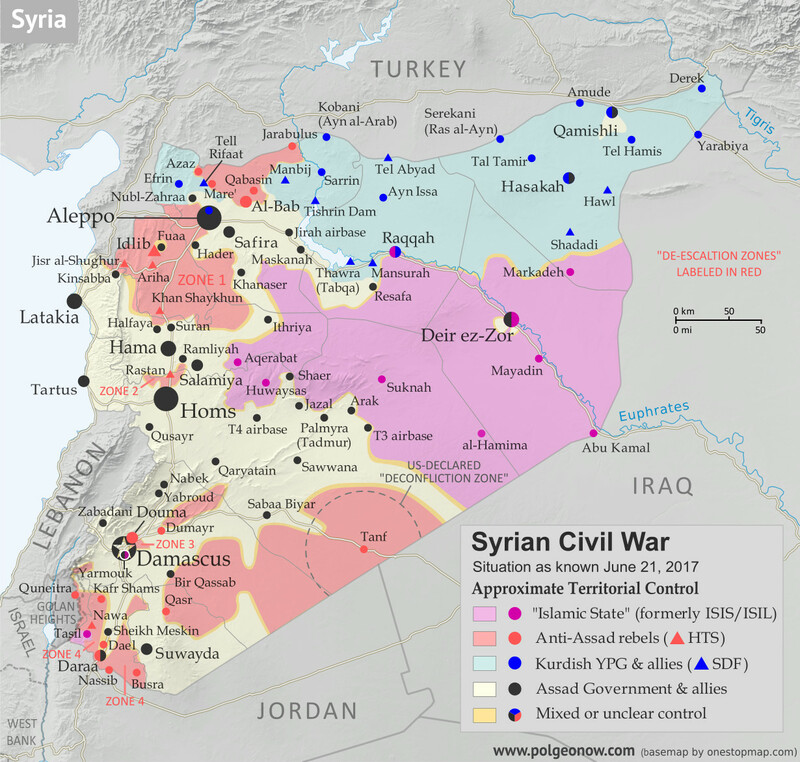 Note: Red triangles on the map represent towns where rebel group Hayat Tahrir al-Sham (HTS) - formerly known as Al Qaeda affiliate Jabhat al-Nusra (a.k.a. the Nusra Front), and later Jabhat Fateh al-Sham (JFS) - is thought to be in a dominant position among rebel forces, even if it doesn't exercise exclusive control. This organization has some presence in almost every rebel-held area in Syria. The following is a timeline of changes to territorial control and other key events in Syria since our previous map update of May 25, 2017. Sources are provided as in-line links. The Syrian Army seized a village three kilometers west of IS-held Maskanah, between Aleppo and Raqqah. Government forces captured 13 villages along the eastern bank of a lake in Aleppo province, coming within 1.5 kilometers of the western entrance to Maskanah. Meanwhile, the army captured a town south of Sawwana, in the southern desert. The army captured a village on Maskanah’s northern flank. The last batch of rebels and family members left the Barzeh neighborhood of Damascus, leaving it entirely under government control. The army advanced against US-backed rebels southeast of Sawwana. The Kurdish-led, US-backed Syrian Democratic Forces (SDF) advanced to within three kilometers of IS capital Raqqah, reaching the city’s northern entrance. The next day, the SDF besieged the town of Mansurah and one more village between Thawra and Raqqah, after capturing several nearby villages. Rebels broke through pro-government militias' first line of defense near a government-held junction in the Sabaa Biyar area (west of Tanf in the southern desert). However, the rebel advance on the junction was subsequently halted by Russian airstrikes. Meanwhile, the army launched an offensive towards IS-held Aqerabat east of Hama, reportedly capturing several villages. The SDF launched an assault on the besieged IS-held town of Mansurah, just west of Raqqah, capturing it later in the day. The Syrian Army seized over a dozen villages south and southwest of Maskanah, cutting off IS’s main supply route between Maskanah and Raqqah. The next day, Maskanah was surrounded, and on June 4 it was captured by government troops. The army also secured its own main supply route to and from Khanaser. These advances brought the army to Raqqah’s provincial border. The army made advances against rebels north of Hama. This was followed by a rebel counterattack attempting to regain control of the lost positions. The army also made a push towards IS-held Arak and Suknah, in the southern desert near Palmyra, capturing several hilltops along the highway. Government forces hit rebel-held parts of Daraa city with air and artillery strikes following a rebel attack on government positions in the city’s Manshiyah district. At least 31 fighters on both sides were killed in the fighting, with the fatalities divided nearly evenly between the two sides. Meanwhile, IS made advances against government forces near the eastern city of Deir ez-Zor, capturing a roundabout south of the city. Fighting continued for control of two hilltops near the southern city's entrance. The SDF seized a dam near Raqqah. The next day, it proceeded to capture six villages north and northwest of the city, tightening the siege of the IS capital. In all, over the previous week, the SDF had taken control of about 350 square kilometers from IS. Government forces reportedly seized several positions east of Salamiya. The US-led coalition conducted airstrikes against a force of 60 pro-government fighters who entered the US-declared "deconfliction zone" centered on the rebel-held town of Tanf, near the Iraqi and Jordanian borders. Two self-propelled howitzers and a self-propelled anti-aircraft gun were destroyed, while a tank was damaged. Pro-government sources reported two soldiers were killed, while other reports said between 10 and 32 government troops died in the attack. Despite the strikes, the pro-government forces remained in place within the zone. Meanwhile, government forces took control of a hill in the eastern countryside of Damascus, near Dumayr. Elsewhere, government troops captured six villages on the provincial border of Aleppo and Raqqah while attempting to link up with the SDF near Thawra. Two of the villages were on Raqqah's side of the boundary, marking the first time in a year that the Syrian Army had entered the province. The SDF started its assault on the IS capital city of Raqqah. The US-backed forces attacked the al-Mashlab district on the city’s eastern edge, as well as a military base around one kilometer north of the city center. The next day, the SDF captured a village and the ruins of a more than 1,000-year-old fortress west of Raqqah, reaching the city’s western outskirts. By June 13, the military base and four neighborhoods were captured by the SDF, including al-Mashlab, Romaniah, al-Sinaa and Hattin. Additionally, the SDF seized parts of the western Jazrah suburb and all or at least half of the western al-Sabahia district. In the first eleven days of the battle, 117 civilians were killed in US-led coalition airstrikes and SDF artillery shelling, while between 142 and 312 IS fighters, as well as at least 15 SDF fighters, also died. In the southern desert, the army seized several hills around Arak, as well as reportedly an area 25 kilometers east of Sawwana. Meanwhile, the SDF captured a village west of Thawra. The Syrian Army captured a hilltop from rebels southeast of Damascus, while the US-led coalition bombed government forces once again near the Iraqi border, destroying two technical fighting vehicles. The US also shot down a pro-government drone that was bombing rebel forces near Tanf. Meanwhile, the army advanced further southeast of Palmyra against IS, while IS withdrew from 20 villages west of Raqqah ahead of a government advance into the area. Elsewhere, government troops reportedly captured a town in the besieged rebel-held East Ghouta pocket, in the eastern suburbs of Damascus. Pro-government forces reached the Iraqi border for the first time since 2015, after going around Tanf and positioning themselves around 70 kilometers northeast of the border crossing. The Syrian Army reportedly met the Iraqi Army on the border. Meanwhile, rebels counter-attacked in the area they had lost the previous day southeast of Damascus, and managed to advance. Elsewhere, pro-government forces captured an area southeast of Palmyra, reaching a strategic crossroad. The army reached the outskirts of Arak and advanced towards Suknah, a remote desert town on the way from Palmyra to Deir ez-Zor. Meanwhile, Jordanian border guards shot and killed five people who were approaching the border from the Tanf area in Syria. The targeted people's vehicles were also destroyed. The pro-Syrian government Al-Masdar News reported that the five dead were "Free Syrian Army" (FSA) rebels who were trying to avoid government forces. Elsewhere, rebel infighting erupted in the northern town of Al-Bab, leaving between 27 and 31 rebels dead or wounded. The army advanced in Daraa city, capturing 25 to 50 percent of the rebel-held Daraa Refugee Camp neighborhood amid vicious fighting. Meanwhile, pro-government forces advanced to a second location along the border with Iraq. The Syrian Army advanced against IS in the desert west of Raqqah, capturing nine villages and reaching the Ithriya-Thawra highway. This left government forces about 40 kilometers from besieging the remaining IS-held villages in the southeast of Aleppo province, as well as some in Raqqah province. The advance would relieve IS pressure on the government’s main supply route for Aleppo, which runs through Ithriya and Khanaser. Meanwhile, an army attack on the IS-held T3 airbase was repelled, but government forces still reportedly managed to advance in a nearby area. Elsewhere, the SDF attacked and captured several mountain positions overlooking a rebel-held town on the provincial border of Idlib and Aleppo. A subsequent rebel counterattack regained all lost positions, but as the rebels advanced they were ambushed by the SDF, suffering heavy casualties. Some 36 rebels were killed in the fighting; it was initially reported that 19 SDF fighters had also died, but later reports confirmed that only one YPG fighter from the SDF was killed (the YPG is a Kurdish "self-defense" militia that makes up the biggest member force of the SDF). The US deployed its HIMARS missile system near the southern town of Tanf. East of Palmyra, the army captured Arak, including its oil fields, as well as the T3 airbase, advancing towards Suknah. The next day, its forces were within 25 kilometers of the town. Southwest of Thawra, the Syrian Army seized an oil field, while the SDF captured several villages. Two days later, the army once again advanced, taking control of more villages and oil fields. On June 17, the army captured 14 villages and hills in the area, closing in on the IS stronghold of Resafa and its nearby road junction. Concurrently, the SDF seized two villages south of Raqqah. The next day, the Syrian Army and the SDF were in a race to reach Resafa, with the SDF capturing a district north of the town, while the army managed to reach Resafa’s outskirts. The army alleged that the US-led coalition downed a Syrian fighter plane bombing IS positions near Resafa. According to the coalition, Syrian government forces attacked an SDF-held town south of Thawra, driving the SDF from the town, after which a coalition show of force stopped the initial government advance towards it. But later, the coalition said, a Syrian Air Force fighter jet dropped bombs near SDF fighters, after which it was shot down by the coalition. In response to the downing of the Syrian jet, Russia announced that all aircraft from the US-led coalition would be "tracked...and treated as targets" any time they crossed west of the Euphrates River. The US military said it was repositioning its planes for safety, and Australia suspended air missions in Syria. On June 19, Resafa was captured by the Syrian Army, while the SDF seized the closest village north of the town, about four kilometers away. Government forces captured a hill east of Salamiya. Two days later, the army captured four villages north of Aqerabat. A 48-hour ceasefire was declared by the army in southwestern Syria's Daraa city. Reportedly for the first time since 2015, the Syrian Army and Iraqi government forces met on the border of the two countries, following advances by Iraqi forces against IS. Meanwhile, the rebels captured about half of a town in the southern countryside of Hama province, but subsequently withdrew due to heavy airstrikes and artillery shelling. The SDF captured the al-Baitara district of Raqqah city. Following the conclusion of the ceasefire in Daraa, government forces resumed their attacks on rebel-held areas of the city, managing to push into some, as well as to advance in Daraa’s western outskirts. Their capture of a former air defence base there apparently split rebel territory in the region in two, but later in the day the rebels recaptured the base. Elsewhere, the army attacked the rebel-held Bir Qassab area, about 75 kilometers southeast of Damascus, and captured it. The same day, the US-led coalition shot down a second Syrian government-affiliated drone that was just outside the Tanf "deconfliction zone", but within firing range of the coalition base. Meanwhile, the SDF captured an area on the southern outskirts of Raqqah, coming close to fully surrounding the city. Recently-elected French president Emmanuel Macron stated that he saw no legitimate successor to Syrian President Bashar al-Assad and that France no longer considered his removal a pre-condition to resolving the conflict in Syria. According to him, the priority was “a complete fight against all the terrorist groups” and to ensure that Syria does not become a "failed state". Meanwhile, the Syrian Army reportedly advanced against the rebels in two areas of Damascus's eastern outskirts.